Image 1: Development of the extension of a hospital (LKH Graz). The area of Graz is located in a valley surrounded by mountains. The majority of fresh air is supplied via a few channel-like streams flowing into the Graz area. 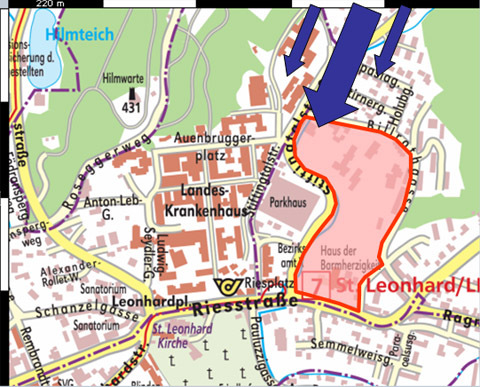 The hospital planning area (see image 2) is located right at one of those important air streams (Stiftingtal area). Hence, the project demanded to design the buildings so as not to block the fresh air stream. Image 2: Local wind distribution (blue arrows) in the Stiftingtal. The planning area is shaded red. 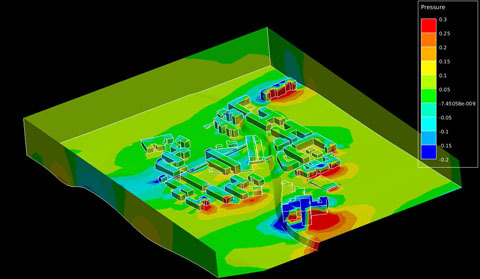 We started with a CFD analysis of the existing hospital buildings. It showed several complicated air flow situations. Then we added the new buildings. 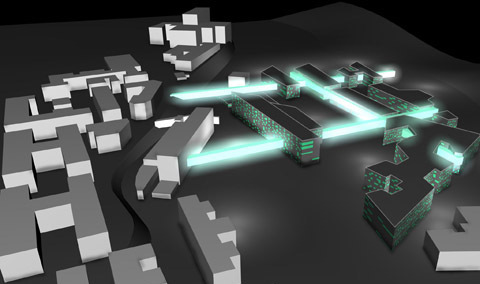 An optimization algorithm was used to improve the air flow situation in the planning area. The outcome was that the new buildings stand like sails in the wind, which improve the overall wind flow for the Graz area (see image 3). Image 3: Pressure distribution and optimization of building geometry.